For many parents, getting children to fall asleep can be a difficult task -- especially on school nights. For parents of bad sleepers, a new study suggests that exposure to screens in a dark room -- whether a phone, computer, tablet, or TV -- can disrupt children’s sleep throughout the night. “While previous research has shown a link between screen use and the quality and length of young people’s sleep, ours is the first study to show how room lighting can further influence this,” said lead researcher Dr. Michael Mireku. The researchers had over 6,600 children between the ages of 11 and 12 participate in the study. All of the participants were asked to answer questions on their sleeping habits, including how difficult they find it to fall asleep and wake up and how their bedtime routines differ between weekdays and weekends. The children were also asked about how their screen time habits play into their bedtime routines. Over 70 percent of the participants reported being in front of at least one screen within an hour of falling asleep. The researchers found that those who were on their phones or watching TV in the dark at least one hour before bedtime were 147 percent more likely to get less sleep than those who didn’t use a screen. When the children used screens in a lit room before going to sleep, they were 31 percent more likely to get less sleep. 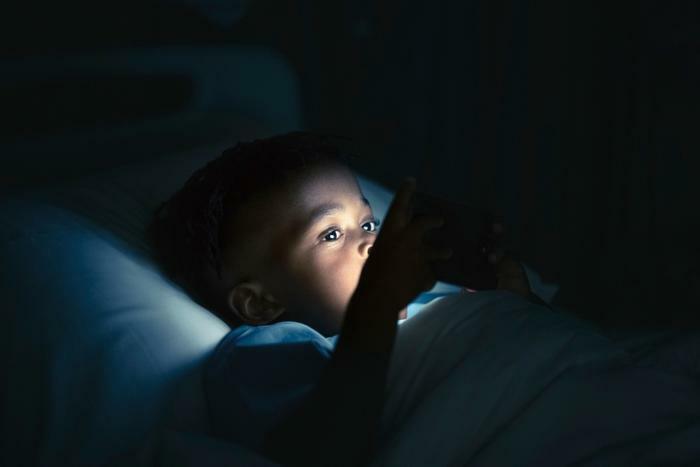 While this study focused on how screen time in dark rooms disrupts sleep, another recent study found that screen time before bed comes with a slew of other side effects -- with poor sleep chief among them. Screen time before bed was linked to fatigue in the morning, poorer sleep quality, less sleep overall, and a higher risk of obesity. Not getting enough sleep comes with several risk factors, big and small, and researchers have found that sleep is especially important for teens. Researchers found that high school students who are getting less than six hours of sleep per night are more likely to engage in risky behaviors, including drinking and driving or substance abuse.